The world turns grey and boring if every tree simply registers as “tree” and before you pass it by. But every tree, every crack in the sidewalk, contains boggling unsolved mysteries. Consider Emma’s shell, above. The tendency of a grown up is to say, “that’s pretty, a robin’s egg.” It takes a child (or a scientist, interestingly) to ask, “why is it blue?” And the answer? Nobody knows. Actually, we have no idea why any bird goes to the trouble of coloring its eggs. 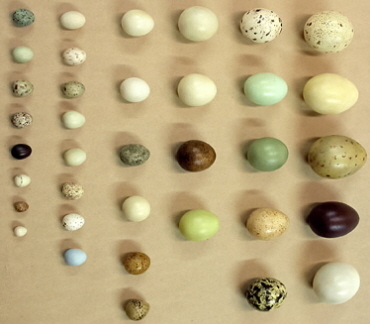 Some birds lay down successive layers of color, streaking their eggs with color glands as they pass through the oviduct. 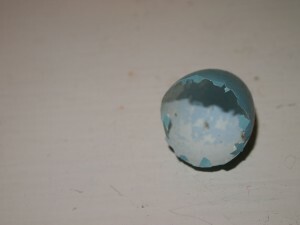 Hypotheses: It could camouflage the egg (but blue? ), or it could help the parents tell which eggs are theirs and root out brood parasites. But again, it’s a mystery. Think the age of Romantic discovery is over? That all the white patches on the map have been filled in? Unexplored territory, right there, in the sidewalk cracks. Have you read Richard Louv’s Last Child in the Woods: Saving Our Children from Nature-Deficit Disorder? Yeah it’s good! And I think that in addition to saving our children, being a little more nature-struck can save ourselves.